The topic is ““Tiny Things” as suggested by Karen. I couldn’t resist photographing my tiny poppets! They look awesome against books, don’t you think? They do look great against books, their colors are so vibrant! I don’t think I ever realised how tiny they are. They look especially good by those particular books too. The books make a great backdrop for them. I’ve never seen any of those around here. Very curious little fellows. Those poppets are SO cute. 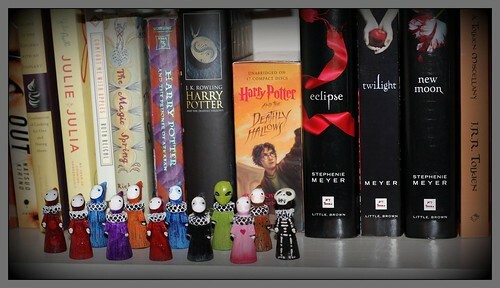 They look so tiny and yet so colorful in front of the books. Great photo! I LOVE those guys. You already know which one is my favorite… Tee Hee. Actually, I would be hard pressed to choose a favorite, their personalities are so cool. Although, tee hee, I posted an alien silimar the one you have here a couple days ago, and my main photo for the challenge today is of, what else? PUPMIKINS! Never enough autumn for me! Of course I mean PUMPKINS. LOL. Sheesh! Those are cute. I think you showed them before but the books put their size in perspective. I have heard those Stephanie Meyer books are great–I’ll have to check them out. Somehow the puppets seem to me to go well with the Harry Potter books behind them. Very fun tiny things and, of course, I love Harry, so I think the picture is delightful! I already associate poppets with books because of Pat/DesLily, but here they also give a sense of scale. Nice variety here, and so many of them! My favorite is still Skelly, though! Love the colors! I did not realize you had so many! Poppets poppets everywhere! More poppets! Yea! And perfectly placed. Good shooting. you’re poppets ROCK (and your taste in reading is pretty spot on, too). The gangs all here! They look great. I’ve been enjoying daily skelly in your flickr photostream for a while! They look awesome by the books … especially the Harry Potter books. Wonderfully done. How cute ! and with the books as background I really can see how tiny they are !